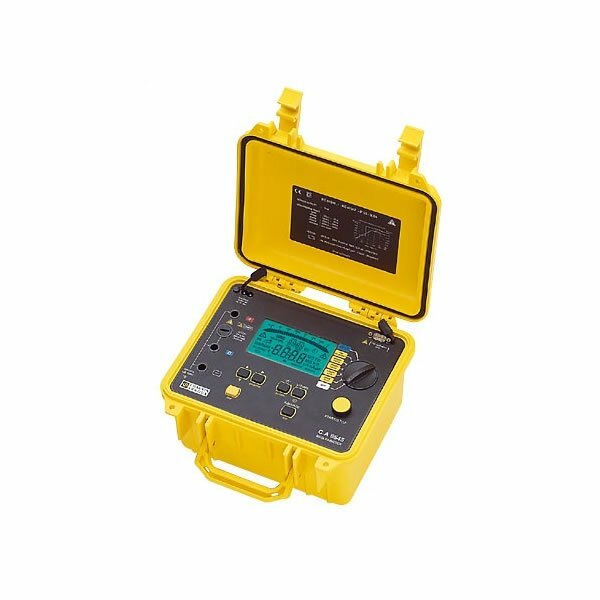 In a hard casing that is site-adapted for the most severe measuring conditions, the CA6545 offers the very best in insulation testing technology and accuracy. In a site-proof case, the Chauvin Arnoux CA 6545 megohmmeter makes a quantitative and qualitative analysis of insulation. It also automatically measures voltage, capacity and residual current. The multiple functions not only qualify the measured insulation, but also provide real preventative maintenance. Wide range from 30kΩ to 10TΩ. 4 fixed test voltages: 500 / 1000 / 2500 and 5000V. From 40 to 5100V in increments of 10V or 100V. LCD screen with digital display & bargraph. Auto calculation of DAR, PI & DD ratios. Safety: IEC 61010-1 Cat.III 1000V or Cat.I 2500V & 61557. Site-proof casing with sealed (IP 53) shock resistant cover. Dimensions: 270 x 250 x 180mm. Chauvin Arnoux C.A 6545 Warranty: 1 year.